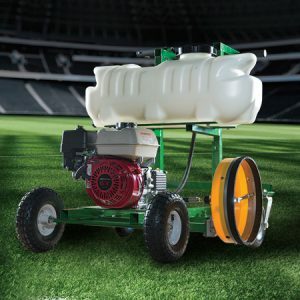 The Water Bug carries its own water supply along with a high-pressure washing system suitable for a range of surface cleaning jobs, including synthetic turf, track surfaces, and concrete walkways. Its 25-foot pressure hose extension, wand, and interchangeable nozzles make the Water Bug a versatile cleaning tool in hard-to-reach areas or areas without ready access to water. The TempLine™ Water Bug was developed specifically for use with our Removable Turf Marking System, but this versatile tool can be used for a variety of tough pressure washing jobs.